អាណាចក្រហានត្រូវបានបែងចែកជាតំបន់ជាច្រើនដែល​គ្រប់គ្រងផ្ទាល់ដោយរដ្ឋបាលកណ្ដាលដែលគេស្គាល់ថាជាអាណាខេត្ត (តំបន់ដែនដីក្រោមការត្រួតត្រារបស់ប្រមុខខេត្ត, ភាសាចិន: 郡, ភិងអ៊ិង jùn, វ៉េដ–ហ្គែយល្ស៍ chün) និង​រាជាណាចក្រពាក់កណ្ដាលស្វយ័តជាច្រើន។ រាជាណាចក្រទាំងនេះបានបាត់បង់ឯករាជ្យរបស់ខ្លួនបន្តិចម្ដងៗ ជាពិសេសបន្ទាប់ពីចលនាបះបោរនៃនគរប្រាំពីរ។ The Xiongnu, a nomadic steppe confederation, defeated the Han in 200 BC and forced the Han to submit as a de facto inferior partner, but continued their raids on the Han borders. Emperor Wu of Han (r. 141–87 BC) launched several military campaigns against them. The ultimate Han victory in these wars eventually forced the Xiongnu to accept vassal status as Han tributaries. These campaigns expanded Han sovereignty into the Tarim Basin of Central Asia, divided the Xiongnu into two separate confederations, and helped establish the vast trade network known as the Silk Road, which reached as far as the Mediterranean world. The territories north of Han's borders were quickly overrun by the nomadic Xianbei confederation. Emperor Wu also launched successful military expeditions in the south, annexing Nanyue in 111 BC and Dian in 109 BC, and in the Korean Peninsula where the Xuantu and Lelang Commanderies were established in 108 BC. The Han dynasty was an age of economic prosperity and saw a significant growth of the money economy first established during the Zhou dynasty (c. 1050–256 BC). The coinage issued by the central government mint in 119 BC remained the standard coinage of China until the Tang dynasty (618–907 AD). To pay for its military campaigns and the settlement of newly conquered frontier territories, the government nationalized the private salt and iron industries in 117 BC. These government monopolies were repealed during the Eastern Han period, and the lost revenue was recouped through heavily taxing private entrepreneurs. The emperor was at the pinnacle of Han society. He presided over the Han government but shared power with both the nobility and appointed ministers who came largely from the scholarly gentry class. From the reign of Emperor Wu onward, the Chinese court officially sponsored Confucianism in education and court politics, synthesized with the cosmology of later scholars such as Dong Zhongshu. This policy endured until the fall of the Qing dynasty in 1911 AD. Science and technology during the Han period saw significant advances, including papermaking, the nautical steering rudder, the use of negative numbers in mathematics, the raised-relief map, the hydraulic-powered armillary sphere for astronomy, and a seismometer employing an inverted pendulum. For a more comprehensive list, see List of emperors of the Han dynasty. Even before Han's expansion into Central Asia, diplomat Zhang Qian's travels from 139 to 125 BC had established Chinese contacts with many surrounding civilizations. Zhang encountered Dayuan (Fergana), Kangju (Sogdiana), and Daxia (Bactria, formerly the Greco-Bactrian Kingdom); he also gathered information on Shendu (Indus River valley of North India) and Anxi (the Parthian Empire). All of these countries eventually received Han embassies. These connections marked the beginning of the Silk Road trade network that extended to the Roman Empire, bringing Han items like silk to Rome and Roman goods such as glasswares to China. From roughly 115 to 60 BC, Han forces fought the Xiongnu over control of the oasis city-states in the Tarim Basin. Han was eventually victorious and established the Protectorate of the Western Regions in 60 BC, which dealt with the region's defense and foreign affairs. The Han also expanded southward. The naval conquest of Nanyue in 111 BC expanded the Han realm into what are now modern Guangdong, Guangxi, and northern Vietnam. Yunnan was brought into the Han realm with the conquest of the Dian Kingdom in 109 BC, followed by parts of the Korean Peninsula with the colonial establishments of Xuantu Commandery and Lelang Commandery in 108 BC. In China's first known nationwide census taken in 2 AD, the population was registered as having 57,671,400 individuals in 12,366,470 households. 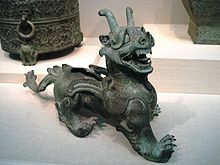 The period between the foundation of the Han dynasty and Wang Mang's reign is known as the Western Han dynasty (ចិនសម័យ: 西汉; ចិនបុរាណ: 西漢; ភិងអ៊ិង: Xī Hàn) or Former Han dynasty (ចិនសម័យ: 前汉; ចិនបុរាណ: 前漢; ភិងអ៊ិង: Qiánhàn) (206 BC – 9 AD). During this period the capital was at Chang'an (modern Xi'an). From the reign of Guangwu the capital was moved eastward to Luoyang. The era from his reign until the fall of Han is known as the Eastern Han dynasty (ចិនសម័យ: 东汉; ចិនបុរាណ: 東漢; ភិងអ៊ិង: Dōng Hàn) or the Later Han dynasty (ចិនសម័យ: 后汉; ចិនបុរាណ: 後漢; ភិងអ៊ិង: Hòu Hàn) (25–220 AD). The Eastern Han, also known as the Later Han, formally began on 5 August 25, when Liu Xiu became Emperor Guangwu of Han. During the widespread rebellion against Wang Mang, the Korean state of Goguryeo was free to raid Han's Korean commanderies; Han did not reaffirm its control over the region until AD 30. The Trưng Sisters of Vietnam rebelled against Han in AD 40. Their rebellion was crushed by Han general Ma Yuan (d. AD 49) in a campaign from AD 42–43. Wang Mang renewed hostilities against the Xiongnu, who were estranged from Han until their leader Bi (比), a rival claimant to the throne against his cousin Punu (蒲奴), submitted to Han as a tributary vassal in AD 50. This created two rival Xiongnu states: the Southern Xiongnu led by Bi, an ally of Han, and the Northern Xiongnu led by Punu, an enemy of Han. The early Western Han court simultaneously accepted the philosophical teachings of Legalism, Huang-Lao Daoism, and Confucianism in making state decisions and shaping government policy. However, the Han court under Emperor Wu gave Confucianism exclusive patronage. He abolished all academic chairs or erudites (boshi 博士) not dealing with the Confucian Five Classics in 136 BC and encouraged nominees for office to receive a Confucian-based education at the Imperial University that he established in 124 BC. Unlike the original ideology espoused by Confucius, or Kongzi (551–479 BC), Han Confucianism in Emperor Wu's reign was the creation of Dong Zhongshu (179–104 BC). Dong was a scholar and minor official who aggregated the ethical Confucian ideas of ritual, filial piety, and harmonious relationships with five phases and yin-yang cosmologies. Much to the interest of the ruler, Dong's synthesis justified the imperial system of government within the natural order of the universe. The Imperial University grew in importance as the student body grew to over 30,000 by the 2nd century AD. A Confucian-based education was also made available at commandery-level schools and private schools opened in small towns, where teachers earned respectable incomes from tuition payments. Families throughout Han China made ritual sacrifices of animals and foodstuffs to deities, spirits, and ancestors at temples and shrines, in the belief that these items could be utilized by those in the spiritual realm. 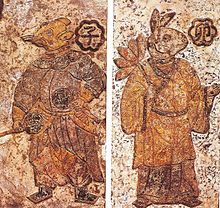 It was thought that each person had a two-part soul: the spirit-soul (hun 魂) which journeyed to the afterlife paradise of immortals (xian), and the body-soul (po 魄) which remained in its grave or tomb on earth and was only reunited with the spirit-soul through a ritual ceremony. These tombs were commonly adorned with uniquely decorated hollow clay tiles that function also as a doorjamb to the tomb. Otherwise known as tomb tiles, these artifacts feature holes in the top and bottom of the tile allowing it to pivot. Similar tiles have been found in the Chengdu area of Sichuan province in south-central China. The Imperial Counselor's chief duty was to conduct disciplinary procedures for officials. He shared similar duties with the Chancellor, such as receiving annual provincial reports. However, when his title was changed to Minster of Works in 8 BC, his chief duty became oversight of public works projects. However, in 145 BC, after several insurrections by the kings, Emperor Jing removed the kings' rights to appoint officials with salaries higher than 400-dan. The Imperial Counselors and Nine Ministers (excluding the Minister Coachman) of every kingdom were abolished, although the Chancellor was still appointed by the central government. In 144 BC Emperor Jing abolished private minting in favor of central-government and commandery-level minting; he also introduced a new coin. Emperor Wu introduced another in 120 BC, but a year later he abandoned the ban liangs entirely in favor of the wushu (五銖) coin, weighing 3.2 g (0.11 oz). The wushu became China's standard coin until the Tang dynasty (618–907 AD). Its use was interrupted briefly by several new currencies introduced during Wang Mang's regime until it was reinstated in 40 AD by Emperor Guangwu. Underground mine shafts, some reaching depths over ១០០ មាត្រ (៣៣០ ភត), were created for the extraction of metal ores. Borehole drilling and derricks were used to lift brine to iron pans where it was distilled into salt. The distillation furnaces were heated by natural gas funneled to the surface through bamboo pipelines. Dangerous amounts of additional gas were siphoned off via carburetor chambers and exhaust pipes. Han-era medical physicians believed that the human body was subject to the same forces of nature that governed the greater universe, namely the cosmological cycles of yin and yang and the five phases. Each organ of the body was associated with a particular phase. Illness was viewed as a sign that qi or "vital energy" channels leading to a certain organ had been disrupted. Thus, Han-era physicians prescribed medicine that was believed to counteract this imbalance. For example, since the wood phase was believed to promote the fire phase, medicinal ingredients associated with the wood phase could be used to heal an organ associated with the fire phase. To this end, the physician Zhang Zhongjing (c. 150–c. 219 AD) prescribed regulated diets rich in certain foods that were thought to curb specific illnesses. These are now known to be nutrition disorders caused by the lack of certain vitamins consumed in one's diet. Besides dieting, Han physicians also prescribed moxibustion, acupuncture, and calisthenics as methods of maintaining one's health. When surgery was performed by the physician Hua Tuo (d. 208 AD), he used anesthesia to numb his patients' pain and prescribed a rubbing ointment that allegedly sped the process of healing surgical wounds. ↑ ២,០ ២,១ Nishijima (1986), 595–596. ↑ ១២,០ ១២,១ Loewe (1986), 122–125. ↑ ១៤,០ ១៤,១ Bielenstein (1980), 106; Ch'ü (1972), 76. ↑ ៤៣,០ ៤៣,១ Hansen (2000), 135; de Crespigny (2007), 196; Bielenstein (1986), 241–244. ↑ ៦០,០ ៦០,១ Torday (1997), 393; de Crespigny (2007), 5–6. ↑ ៧៧,០ ៧៧,១ de Crespigny (2007), 602. ↑ ៩៤,០ ៩៤,១ Beck (1986), 351–352; de Crespigny (2007), 36–37. ↑ ១៧៨,០ ១៧៨,១ ១៧៨,២ de Crespigny (2007), 1228. ↑ ១៨៨,០ ១៨៨,១ Bielenstein (1980), 105–106. ↑ ១៩២,០ ១៩២,១ Nishijima (1986), 599; Bielenstein (1980), 114. ↑ ១៩៨,០ ១៩៨,១ Nishijima (1986), 586. ↑ ២៣១,០ ២៣១,១ Nishijima (1986), 561–563. ↑ ២៣៥,០ ២៣៥,១ Ebrey (1999), 76. ↑ ២៤៥,០ ២៤៥,១ Watson (2000), 108. ↑ ២៩០,០ ២៩០,១ Temple (1986), 179. ↑ ២៩៥,០ ២៩៥,១ Needham (1986c), 308–312, 319–323.